There are many reasons why so many folks are in love with the idea of owning a home on a Caribbean island. But with thousands of islands scattered across the Caribbean, which one should you go for? 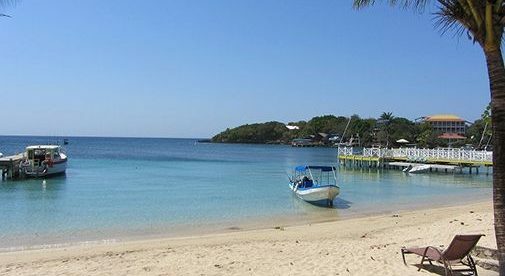 Roatan is one of the Bay Islands. It’s fringed by the second-largest barrier reef in the world. With warm, clear waters and an astonishing array of marine life, it’s a diving and snorkeling paradise. Its beaches are gorgeous, too. It’s easy to find one that’s not too busy (the exception is West Bay beach on days when a cruise ship is in). The photo above is of the beach at Half Moon Bay on a Saturday morning. The island is still relatively unspoiled and has buckets of easy-going Caribbean charm. The locals I met were laidback and friendly, not the least bit pretentious, and happy to see foreign visitors (tourism is the biggest driver of Roatan’s economy). I stayed in West End as a base and it was a good choice. You can walk to the beach and stroll the little downtown strip in the evenings. West End has a good choice of dining options, with seafood, rotisserie chicken, pizza, and even Thai food up for grabs. It’s easy to understand why many visitors to Roatan buy property here…either a vacation home or a lot to build their dream home. Foreign buyers here are mostly North American. When the U.S. went into recession in 2007/2008, Roatan’s real estate market was badly hit, with some developers still feeling the effects today. That slowdown has thrown up some good real estate deals. In a gated community on the west side of the island there is a third-of-an-acre lot with an ocean view. It’s being offered with seller finance. The community has a swimming pool, private access to a pretty beach, a fitness center and a restaurant. Many owners have already built homes, with more under construction. There is also on-site security, as well as property and rental management. The lot is listed at $59,000. I’m not sure if it’s the Dutch influence…but Aruba is one of the most organized Caribbean islands I’ve visited. The tap water’s drinkable (straight from a modern desal plant). The public bus service is good, making it easy to get around the island. And, when your driver says 10 a.m. sharp, he means sharp. There’s no stressed-out hassle, though. Arubans have managed to combine efficiency with easy-going island charm. It’s an intriguing mix. Tourism is the island’s biggest business. They work hard to make visitors feel very welcome. And, it’s paying off. Aruba is apparently one of the most re-visited Caribbean islands. Aruba has a desert landscape with cacti and the famous divi divi trees (which are usually twisted by the sea breeze into stunted, deformed shapes that are beautifully sculptural). The Palm Beach area is a tourist hot spot. This is where I’ve stayed (and would happily stay again). It’s super convenient, with spectacular beaches, a movie theater and gourmet eateries (Italian, French, Mexican, Brazilian, plus good ice cream and coffee). 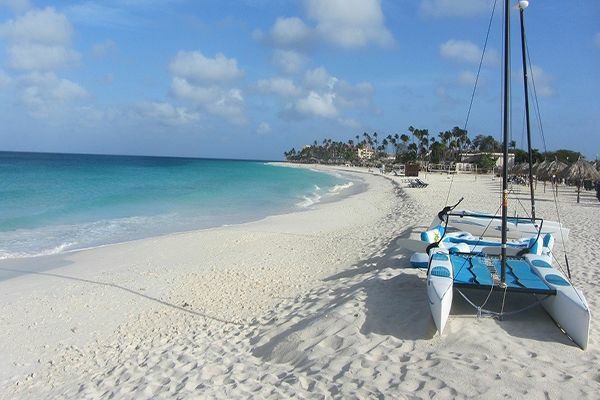 With a mix of European and North American buyers, Aruba’s real estate was impacted by the 2007/2008 recession. But there wasn’t a market crash. A two-bedroom, two-bathroom condo with a wide ocean and beach view is currently for sale. It’s walking distance to both Eagle Beach and Palm Beach. It’s in a resort-type community with two swimming pools, a gym, a mini-mart, restaurants, and a concierge service. This type of condo appeals to renters and there is on-site rental management. The condo has a lock-off layout for maximum rental flexibility; you can rent it as a two-bed, or a one-bed plus suite. The 1,010-square-foot condo comes with top-of-the-line Italian furniture and high-end fixtures—it’s move-in ready. The asking price is $630,000. Samana is wild, untamed…and a fabulous location for a second home. 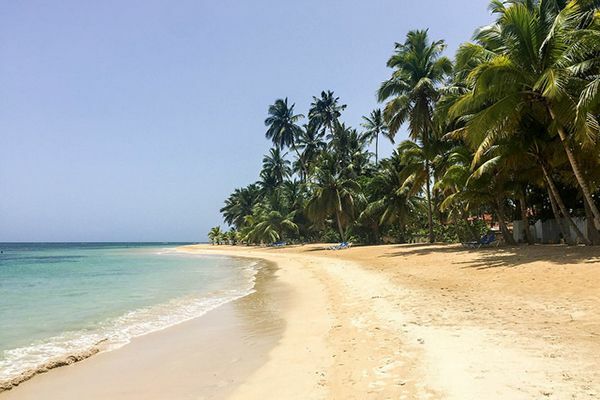 When most folks think of the Dominican Republic, they think of all-inclusive vacations…and, for sure, you can find that in some parts of this Caribbean island. But you’ll also come across one of the oldest capital cities in the Americas…thick forest, mountains, and waterfalls…and some of the finest, most pristine beaches in the Caribbean. This place definitely runs on island time. There’s no point worrying about deadlines or work commitments when you’re here…they melt away in the tropical sunshine. My favorite spot is the Samana peninsula, on the east coast. It’s completely different to anywhere else on the island. It’s got rich, green hills and mountains and postcard-perfect beaches like the one above. It’s close to Los Haitises, a big national park where huge rock formations plunge down to emerald-green waters. The park has petroglyphs and pictographs and more than 200 species of birds. Las Terrenas is a small, walkable town in Samana. Around a third of the town’s population is European, so you can get great coffee, wood-fired pizza, and fresh croissants from a little bakery. Europeans started coming in the 1980s, when getting to Terrenas was still a drag. But new roads and an international airport 25 minutes from town have opened it up to a new market. More North Americans are coming now, as well as Canadian snowbirds. The hotels in Las Terrenas are mostly small and family-run. In high season, it’s usually impossible to find a place to stay in town. And, it can be tricky even when it’s not high season. Second-home owners here can make a nice income stream when they’re not enjoying their home themselves.